Librarians, as it turns out, are not so great at publishing in open access outlets, or self-depositing their research in open repositories. In fact, Library Pipeline’s Green Open Access Working Group estimates 91% of published LIS literature is toll access. 91%. This glaring irony is something I experienced firsthand after completing my MLIS and began working in an academic library at an institution that did not have a library school, which meant no subscriptions to LIS journals. I had several research projects continuing on from work launched during graduate school, as well as a slew of new research ideas I was excited to delve into now that I had a full-time, fully-supported position. Yet despite having studied open access issues, and been privy to conversations citing this issue, it was not until I tried to conduct LIS research myself as a professional in the field that I became aware of how painfully prevalent toll access articles are in our discipline. Projects like the Green Open Access Working Group take a grassroots approach2 to tackling this issue, by having volunteers (like me) directly email authors of recently published (paywalled) articles to see if they’d be willing/able to make a copy available openly, and at the very least, encourage them to think about journal policies and any related authors’ agreements in the context of open access next time they publish. The group also contacts editors of the same toll access journals to share info about the project. This process is not as contentious as you might expect, and has received indications of support from various LIS journals, as the Working Group outlines in this 2016 article written by Stacy Konkiel, chair of Library Pipeline’s Advisory Board, and Idealis co-founder. As the GOAWG began colle cting data, Stacy mulled over another piece of the puzzle: how would librarians find open access materials when they were scattered disparately across various publisher and scholarly profile platforms, institutional and general repositories, and individual websites, and included so many non-traditional formats? “We were tired of debating Green vs. Gold OA,” Stacy explained. “Both arguments are largely irrelevant to a profession that releases some of its best scholarship as white papers, presentations, and other non-article formats. So, we decided to stop talking and start doing: hence The Idealis, an overlay journal that recognizes great LIS scholarship in all its forms.” First conceived as an OA LIS megajournal, The Idealis refocused its approach to reflect feedback garnered from experts in the field: librarians are busy; it is curation, not simply aggregation that would benefit them the most. Librarians need help sifting through the overwhelming volume of scholarly output to locate the best open access LIS research. The Idealis vision hopes to meet this need by harnessing the power of “the greatest information resource known to humankind–librarians,” to carefully curate a journal of research relevant to the needs of library practitioners. Each week, librarians of practice and other scholarly communications experts recruit and share what they consider to be top-quality, not-to-miss research in the field–whether recent, canonical, or previously undiscovered pieces in need of further circulation. In addition to a focus on expert-curation, The Idealis emphasizes inclusion of all forms of scholarship–from grey literature to datasets and annotations–in an effort to connect time-strapped librarians with all the myriad tools at their disposal, delivered to them directly by signing up for new submission updates via Twitter, email or RSS feed, or discoverable via the journal database. The Idealis founding editorial team (Stacy, Nicky, and myself) selected scholarly communications as the first collection focus because it is our collective area of expertise, and is often directly involved with open access work. 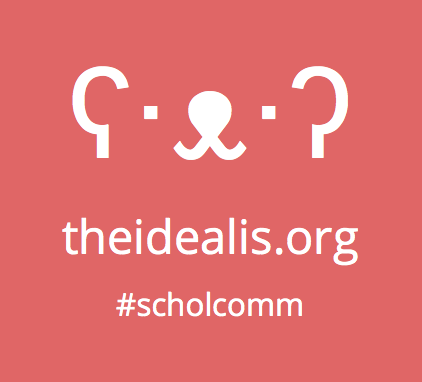 The Idealis embraces a broad definition of scholarly communications in terms of collecting scope, and considers research data management scholarship, copyright, and digital humanities research (as it pertains to librarians’ work) under that umbrella. In efforts to further promote an open model, The Idealis shares its editorial guidelines and suggestions, encouraging editors and readers to contribute to the community’s iterative development. We are extremely thrilled by the diverse knowledge-base and enthusiasm of our spectacular first round of editors, and the scholarship they’ve curated for The Idealis thus far. The Idealis intends to expand next into archival scholarship (an area notoriously lacking in OA publications), with critlib and open education on the horizon. Our founding editor braintrust is finalizing longer-term strategic plans aimed at sustainability, and focused on advancing new forms of digital scholarship that promote collaboration and openness. Visit The Idealis to sign up for “new research” alerts sent to your inbox, RSS feed, or Twitter timeline. If you are interested in joining our editorial team, application information can be found here. Please follow @theidealis on Twitter and help spread the word about this new resource for academic librarians! 1. I recently accepted a new position as Engagement Manager at Altmetric and felt it most appropriate for me to step down from this role considering I no longer work in an academic setting. I find it exciting that librarians, archivists, and other information scientists can work in myriad environments and sectors, and hope the value of our skill sets and approach will be wider utilized. 2. The Open Access Button is another fantastic project that focuses advocacy work on author/institutional access points via researcher requests.